Repair LP | Hawk Research Laboratories, LLC. 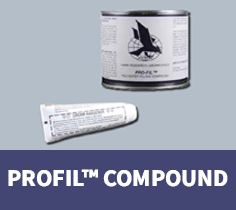 ProFil Compound is a reconstruction and repair filler for porcelain and fiberglass surfaces. ProFil compound looks professional, provides excellent color hiding and receives most primers and topcoats. 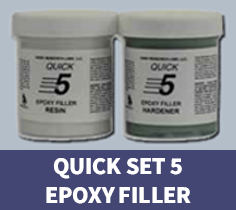 Quick Set 5 has a 5-minute set-up time and is sandable for 60 minutes. It forms a rock-hard patch that is fully compatible with all Hawk primer and topcoat systems. Its white resin and clear catalyst combine to form a white mixture that is easy to cover and is waterproof when dry.